With the Cariboo Gold Quartz Mining Company ceasing operation in 1967, much of the employment needed to sustain a town the size of Wells disappeared. Although employment had been slowly dwindling since the early 1960's, with the Cariboo Gold Quartz ceasing it meant that a large source of income for the population of Wells ended. 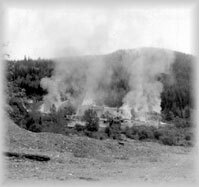 The Wells Townsite Company continued operating under the Cariboo Gold Quartz until both closed down in 1967. Townsite houses were sold to privately, the Community Hall was sold to the Wells Chamber of Commerce, and the Hospital ceased operation and was also sold privately. The Provincial Government took over the Wells School. Because there was no body to take charge of the day to day running involved in a town like Wells, the Wells Improvement District was formed in 1967. It operated under the Cariboo Regional District (CRD) a local government body, based in Quesnel, and its purpose was to administer the day to day operations of the Wells Townsite, previously run by the Cariboo Gold Quartz Mining Co. It was the first elected body in the town of Wells. 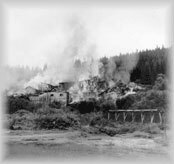 Some of the various duties performed by the Wells Improvement District and later taken over by the Cariboo Regional District included the administration of the Centennial Hall, maintenance and running of water, garbage and sewer systems, and upkeep of fire streetlights. As well the Wells Improvement District was also involved in numerous campaigns pertaining to the well being of the area, such as the failed soil remediation project. This project tried to reclaim land that had been poisoned by the use of mining chemicals. 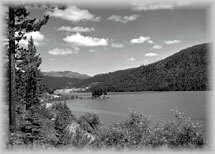 Another project that the Wells Improvement District was involved in was the protection of the Wells Barkerville corridor from extensive logging. The Cariboo Regional District was set up to administer Œrural¹ areas. As the majority of voters under the management of the Cariboo Regional District were not based in Wells, it meant that quite often decisions would be made that would affect the population of Wells, even though it was something that the people of Wells may not have necessarily voted for. The residents of Wells had very little control over the decisions made by the CRD and government. Most of the decisions on tax rates and budgets were set outside of Wells by the CRD. By becoming a municipality the people of Wells would have more say in what they wanted to happen in Wells. They would be in charge of administration, recreation, roads, water, sewer and other services, by voting through a mayor and six councilors. Since 1967 the economy of the Wells area has been mostly dependent on the short tourism season and a small amount of logging. The later 1960¹s and 70¹s were a very slow time for the community, when nothing much seemed to happen. Many of the transient population that had lived in Wells during the 1960¹s had gone and even the local ski hill and jump now had to complete with a new ski hill at Pine Grove Creek, near Wingdam21. On November 15, 1997, residents voted 92 for and 63 against, for Wells to incorporate and hence became the newest municipality in British Columbia. This meant that the Cariboo Regional District would no longer govern Wells. On June 13, 1998 a mayor (Joseph Jourdain) and six councilors (Judy Campbell, Barbara Cirotto, Dave Hendrixson, Carol McGregor, Robin Sharpe and Virginia Wilkins) were voted in, and the inauguration was held on Monday June 29, 1998. In 1999, Wells was one of three communities in BC chosen to be "Gateway Communities" under the British Columbia Parks and Backcountry Gateway Program. A Gateway Community is defined as "a place of unique character and charm that is the service or staging area for eco-tourism and adventure travel"22. A group of locals representing the private and public sector in Wells, Barkerville and Bowron Lake joined together to develop a business plan that came up with a number of projects that the community felt would help in developing the Gateway concept. These ranged from participating in local land use planning, to developing stronger links between eco-tourism and cultural tourism, to developing ways of marketing Wells. The funds received through the Gateway program were used to gain other funds to support further community development projects. A part-time coordinator ensures that all projects run smoothly. The end result is expected to be increased tourism and new business starts in the eco-tourism sector, leading to a more stable economy in Wells23. Although Wells is no longer the booming town of the 1930¹s and its population has dwindled from a high of 4,500 to 270 permanent year-round residents today, it is worth noting that Wells still persists as a lively community. Many plans are in store for this tiny town especially with projects like the Gateway program. Input both financially and physically from various community members who continue to upgrade and improve the infrastructure in Wells will ensure that the town continues to exist. The fact that Wells continues to survive is testament to the fact that Wells is as tenacious as its founder, Fred Wells.